performances, so consider Ballet Day on February 7 a perfect opportunity to learn more about it. Whether you're dressing in a particular attire or attending a performance, there are a variety of ways to celebrate the day in NYC. The bun is the iconic hairstyle of ballet dancers, so in honor of Ballet Day, put your hair in the style. If you don't want to do the ballet style bun, there are a variety of other versions to try. Should you need some ideas, ThePerfectBuns.com is an excellent site to check out. There are many who always wanted to take ballet classes but never did. Consider taking a class on February 7 even if you have zero experience. Whether you're an adult and a complete beginner or you used to dance when you were a kid, there are still plenty of classes you can take. Two places in NYC worth checking out are Broadway Dance Center and SHOCKra. If you don't want to dance ballet but know someone who does, consider celebrating Ballet Day on February 7 by purchasing classes for that person. The recipient will adore the gift and you for helping them celebrate the day. Years ago while I was out dancing at a club where almost any outfit was acceptable, I saw a girl wearing a tutu and ever since I've had a love of them. 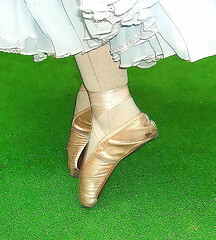 Who cares if the traditional way to wear them is while dancing ballet. If you want a tutu, buy yourself one even if it means you're just wearing it around the house. There are a variety of options to consider including a Shabby Chic Pink Tutu, a Jet Black Tutu, or a Pixie Dust Tutu. There's something special about seeing a ballet performance in person. There are no shortage of places to see one in NYC, but two of the best are the American Ballet Theatre and the New York City Ballet. Go by yourself or grab a friend, dress up and celebrate Ballet Day in one of the best ways possible. An easy way to celebrate Ballet Day on February 7 is by decking yourself out in ballet-inspired accessories. You can wear a Ballet Shoes Necklace, a Degas Ballerina Necklace, or Ballet Shoes Earrings. Another option is by using Ballet Nail Decals. The items are also inexpensive enough that you can give them as gifts even if you're on a tight budget. NYC is one of the best places to celebrate Ballet Day on February 7. Grab your tutu and head out in the city to honor one of the most beautiful dances there is. Photo copyright belongs to ruurmo via Flickr. Why? It's one of the most beautiful dances in the world. View all articles by L.R. Where Do You Find Australian Foods in New York? How Will You Celebrate Public Sleeping Day?